"A Google User" Google Maps Review Issue? Home > Google News > Google Maps > Are Your Google Maps Reviews Showing "A Google User"? 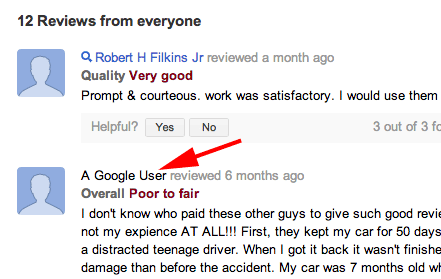 Are Your Google Maps Reviews Showing "A Google User"? A Google+ Local Help thread has a complaint from a local SEO consultant that one of his clients is now missing a lot of reviews, plus many of the reviews are no longer showing from real people - instead they show from "A Google User." We're working with a client on local optimization, etc. We've experienced the same problems as many other with getting legitimate customer reviews to show up, but that's not my question. Today I noticed the number of reviews for the business went from 8 to 12 on the Google+ page and there are 4 blank reviews by 'A Google User' at the bottom of the list. Any idea what causes this and if there's anything we can do to either help get the real review to show up or get the blank reviews to not show up? Looking into this, thanks for bringing it to our attention. Forum discussion at Google+ Local Help.